During the morning of September 11, 2011, the World Trade Center was the site of an unprecedented domestic terrorist attack. At least 2,977 innocent people were murdered in that attack along with hundreds of other that were injured in the ensuing disaster. Thousands of others, including many first responders, have fallen ill due to their exposure on September 11th and the weeks that followed. N.C.P.D. 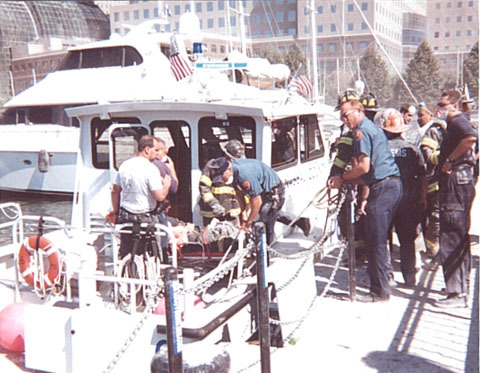 Marine Bureau Police Officers took decisive and immediate action to respond and assist at the World Trade Center disaster scene on September 11th. Five patrols boats staffed by patrol crews quickly responded, and some patrol bpats and crews were on scene prior to noon that day. 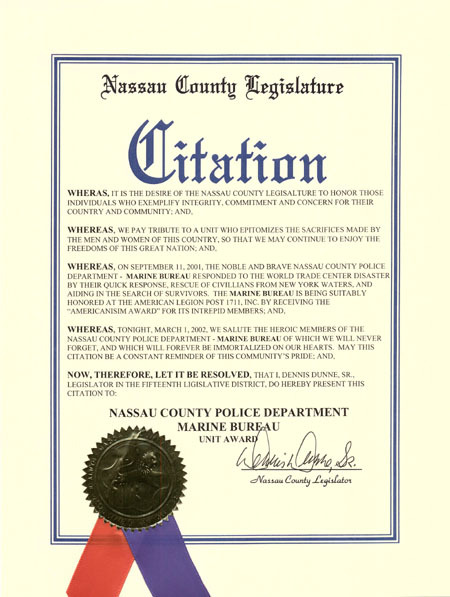 The Marine Bureau was, in fact, the first unit of the Nassau County Police Department to respond and arrive on scene. The early hours of this disaster were clearly chaotic, morbid, sureal and unlike any major police incident our members had ever been assigned to. Fallen sections of concrete, steel girders, fascia panels, glass shards, building materials, infrastructure components, crushed vehicles, heavy smoke, acrid fumes, an abundance of dust and debris, and bodies were the backdrop to this horrific scene. The dust on the ground was more than a foot deep in some places. Upon arrival at the North Cove Marina, our supervisors and patrol crews were met by and worked closely with F.D.N.Y. Battalion Chief James Harten and his staff. Our Police officers immediately assisted with the emergency treatment and evacuation of injured F.D.N.Y. Firefighters, N.Y.P.D. Police Officers and affected civilians. Chief Harten had indicated where a make-shift morgue had been set up adjacent to the North Cove Marina, as it would surely be needed. Communication capabilities were quite limited and intermittent. Radio and cell phone communications were only accomplished from patrol boats at the mid-point of the Hudson River (North River) or along the shore on the New Jersey side of the river. This was a war zone. Our patrol crews worked diligently and continuously to assist many injured Firefighters, Police officers and civilians within the vicinity of the southwest corner of the "pile". This was the first and most important assignment for our members at the disaster scene. Some of the asisted victims were in serious or critical condition. One 26 year old seriously injured Firefighter was reportedly the only survivor of his F.D.N.Y. Company. Our members first evacuated the injured victims north to Chelsea Piers, then over to Jersey City, and finally to Liberty State Park (N.J.) where a large triage center had been established. As time went on that day, the N.Y.P.D. had requested that we continue on with the E.M.S. evacuation. Not one of our Police Officers ever stopped working due to regard or fear for their own personal safety. Our members persevered, even amid the threat of a possible further attack, the poisonous air they were breathing, the dangerous ground conditions, or the potential for another building collapse. Marine Bureau members focused on forging ahead to assist and evacuate all those in need. Our members made a difference and performed admirably. This was the N.C.P.D. Marine Bureau's "finest hour". In the days that followed, N.Y.P.D. Police Commissioner Bernard Kerik requested that the N.C.P.D. 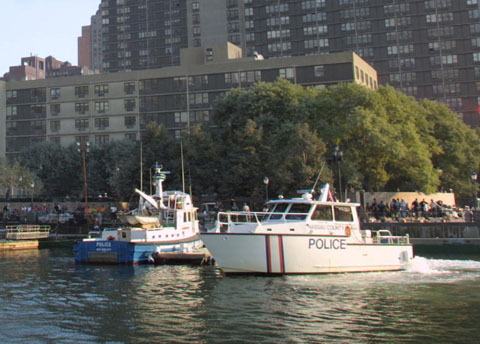 Marine Bureau remain on scene in New York City (Lower Manhattan) to assist both N.Y.P.D. and F.D.N.Y. with disaster operations. N.C.P.D. Police Commissioner William Willett complied with the request, and the Marine Bureau continued to provide 24/7 assistance until Septemeber 26th. Unfortunately, many of our Police Officers now find themselves to be ill as a result of their exposure at the World Trade Center disaster site on September 11th and during the weeks that followed. Proudly and deservedly, the members of the N.C.P.D. Marine Bureau who responded on September 11, 2001, and those who were assigned to assist in the weeks that followed are now the recipients of the United States 9-11 Medal. Please be patient and allow pictures to load. 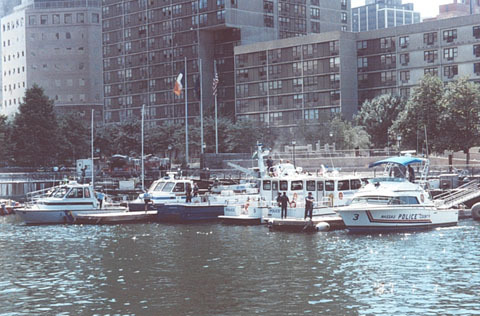 A view of the World Financial Center as seen from the Hudson River by marine patrol officers aboard Nassau County Police patrol vessels only 3 hours after the World Trade Center towers were attacked and subsequently collapsed. 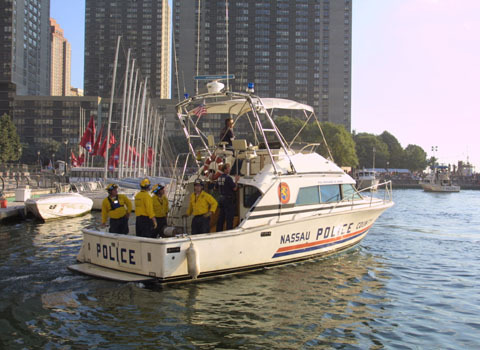 Nassau County Police marine patrol vessels were used daily to transport untold numbers of doctors, nurses and other medical professionals that were needed to treat the multitude of injured rescue and recovery workers at "Ground Zero". Nassau County Police marine patrol units worked together with units from several other marine patrol agencies to assist the N.Y.P.D. Harbor Unit with a broad range of disaster management assignments. Rescue and recovery professionals from all across the United States came to assist at the W.T.C. disaster. Shown here is a search and rescue team from Missouri being transported aboard N.C.P.D. Marine 1 to "Ground Zero". Nassau County Police marine patrol units assisted and acted at the direction of the N.Y.P.D. 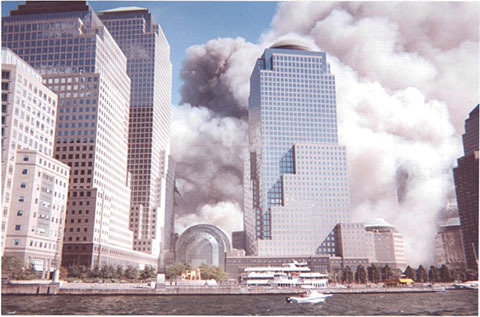 Harbor Unit on September 11, 2001 and during the weeks that followed. This is an aerial view of "Ground Zero" showing the close proximity of the marine staging area (bottom) to the W.T.C. disaster site. 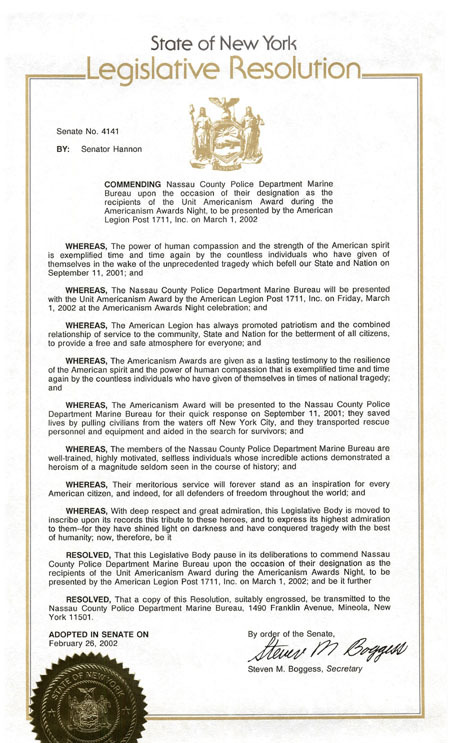 The below displayed legislative citations were presented in recognition of the emergency response and rescue efforts of the members of the N.C.P.D. 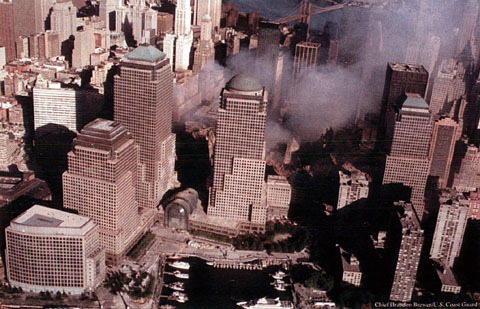 Marine and Aviation Bureau during the World Trade Center disaster on September 11, 2001 and during the weeks that followed.